True knitters can never have enough knitting patterns in there collection because you never know when the mood to start a new project will hit you and the first step is invariably hunting through that collection to find the perfect pattern. 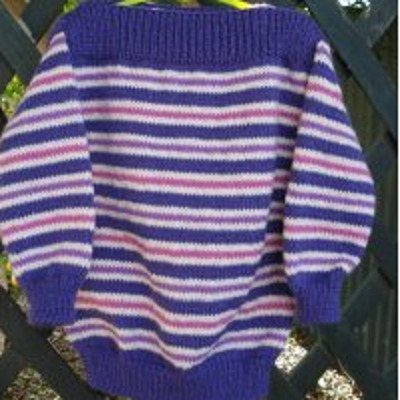 Knitting patterns are very important to both experienced knitters and beginners and you will find that when you have been knitting for a while, one of your most prized possessions will no doubt be your pattern collection. After 50 years of knitting, as you would imagine, my collection is rather large. It includes pattern books that I have bought over the years, patterns clipped out of magazines (the patterns in the English Women's Weekly were great), hand-written patterns which were given to me by grandmother, and old pattern books from the 30's, 40's and 50's given to me by people who know I am a keen knitter. It also now include a hard drive full of electronic copies of knitting patterns from all over the world, so I can take a huge portion of my knitting pattern collection with me where ever I go! I do have quite a few free patterns on this site, some are my own designs and others I have permission from the designer to give them away to my visitors. 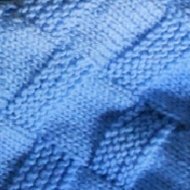 The patterns have almost no shaping and use one or more of the basic knitting stitch patterns (usually garter stitch) which makes them suitable for beginners. 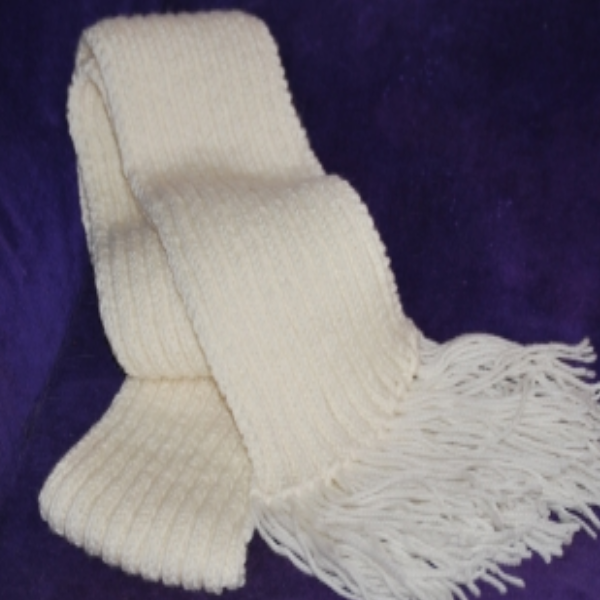 Scarves can be as easy as knitting a long stripe of garter stitch or quite complicated with a fancy knitting stitch pattern and they can be made in a variety of different shapes and sizes depending on who the scarf is for and how you intend them to wear it. 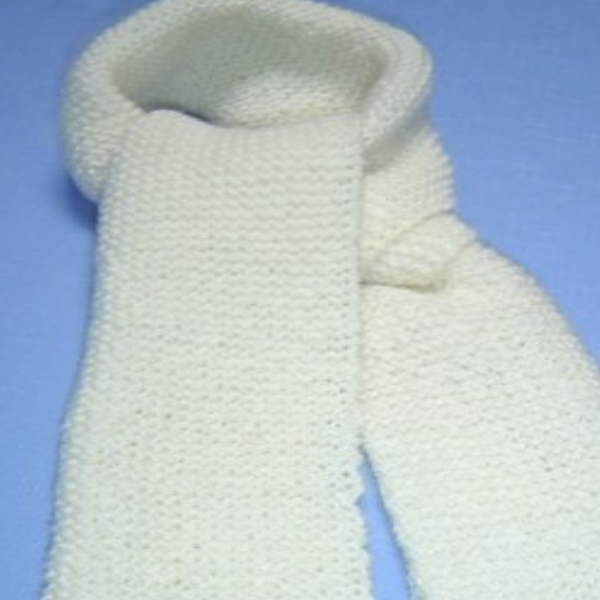 Once you have learned the basic stitches, knitting scarves can be a practical way of practicing your new knitting skills. 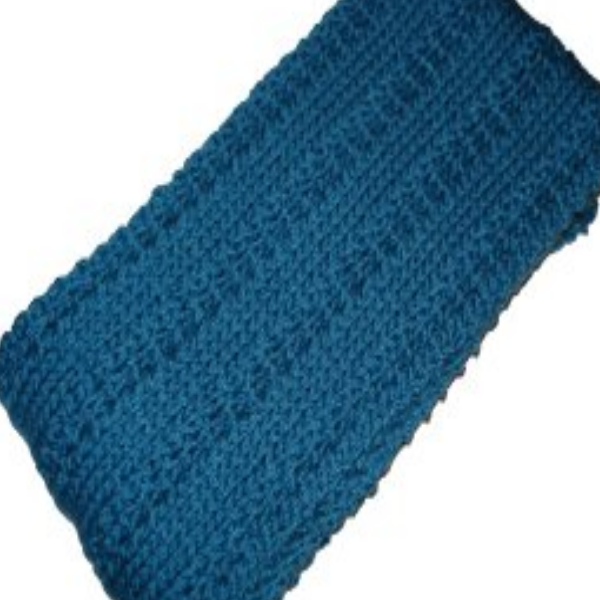 I suggest you start with something simple, like a garter stitch or rib scarf. 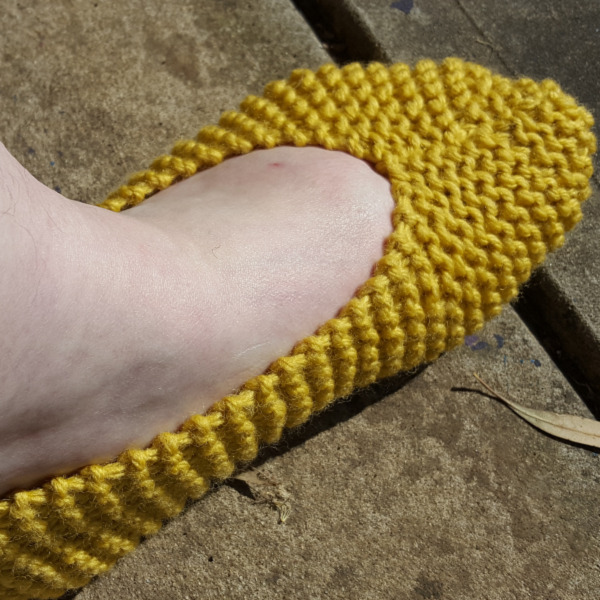 You can make it as wide and as long as you want it to be just by adding or omitting stitches on your cast on edge and knitting more or fewer rows before your cast off edge. Personally, I have a rather large collection of pattern books for baby wear. Many of them dating back from when my three kids were babies, and I have inherited quite a few from my mother and grandmother, but most are relatively new. I do spend a fair bit of time knitting baby items and that often results in me playing with basic patterns to create unique patterns of my own. To do that I have to develop basic patterns that can be customised, and those patterns are ideally suited to beginners. 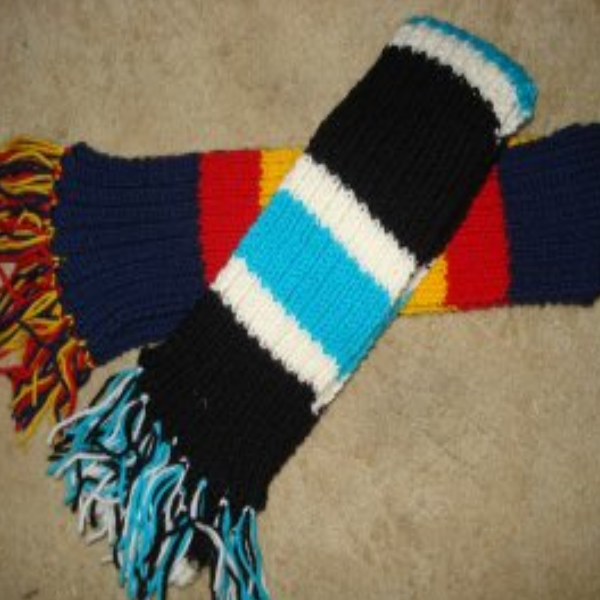 Some of these blankets are knitted in pieces and some are knitting in one piece on long needles (35cm long usually or a circular needle 60cm or longer). All of them are relatively easy to do but involve a fair bit of knitting. Expect to be working on these projects for quite a while! 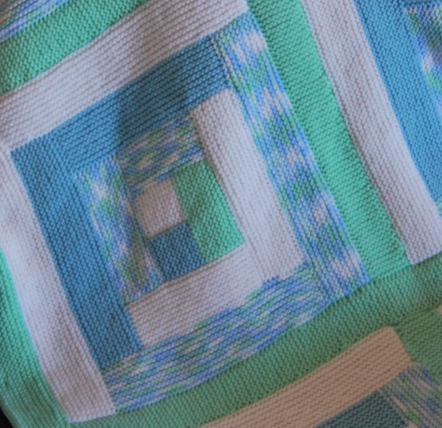 Most of these patterns can easily be altered if you want a smaller or larger blanket and the knitting techniques used are fairly basic - you will need to know or learn stocking stitch, garter stitch, casting on and casting off and for some of them you will have to learn how to do a couple of different type of decreases and how pick up and knit stitches along the edge of a piece of knitting. 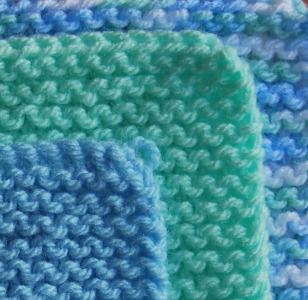 Garter stitch squares are probably the most common type of blanket square. 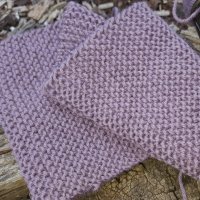 They are fairly easy to make, and most beginners start with garter stitch so a blanket made with garter stitch squares is the perfect project for them. Each square is reasonably small and can be tackled by most beginners without them risking a feeling of being overwhelmed. 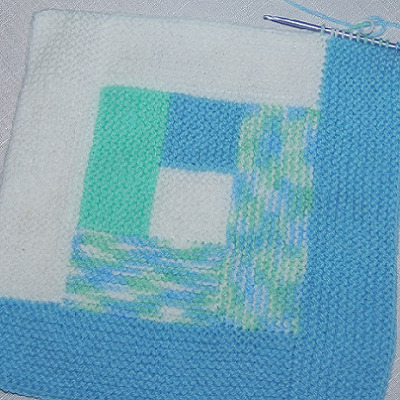 You can also make use of 'leftovers' or odd balls of wool to make your squares which will save you money and you will end up with a brightly coloured blanket when you are finished. 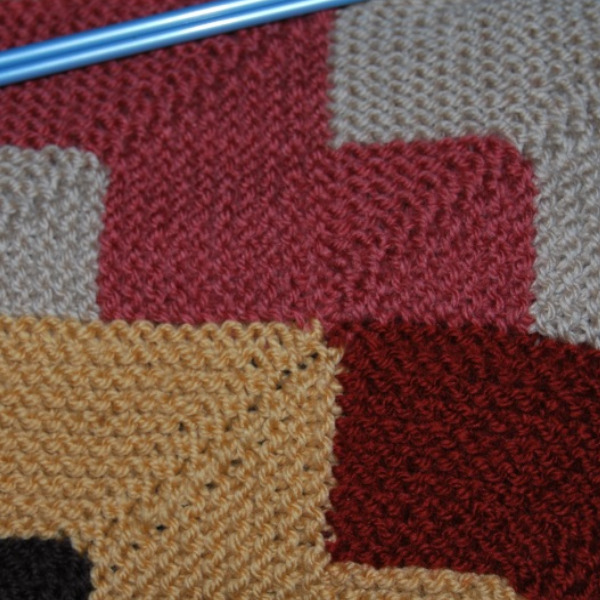 However, you don't necessarily need to stick with garter stitch or with straight knitted squares. 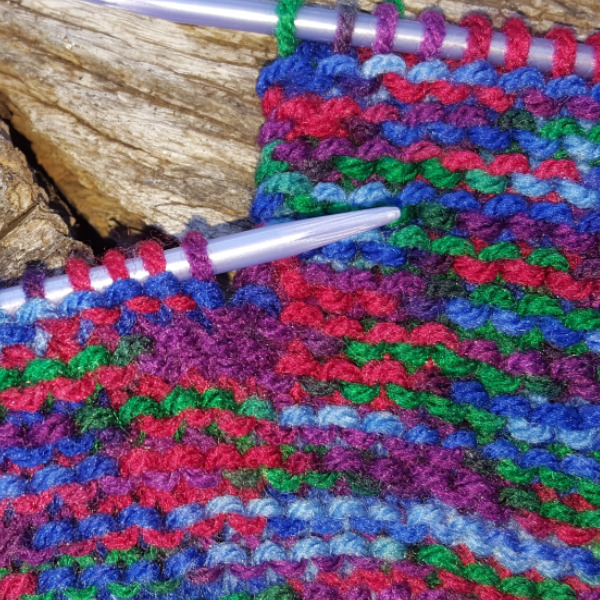 When you have a bit more experience as a knitter, you might like to try mitred knitting or perhaps you make your squares using a different knitting stitch pattern. I am always on the hunt for new patterns or new ideas for my next knitting project and I quite often visit the three sites below to check for new patterns. 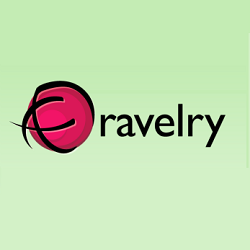 Both Ravelry and LoveKnitting have listings for both free patterns and patterns that you are going to have to pay for. The patterns on Etsy's are all for sale, so not free but most of them are fantastic patterns. 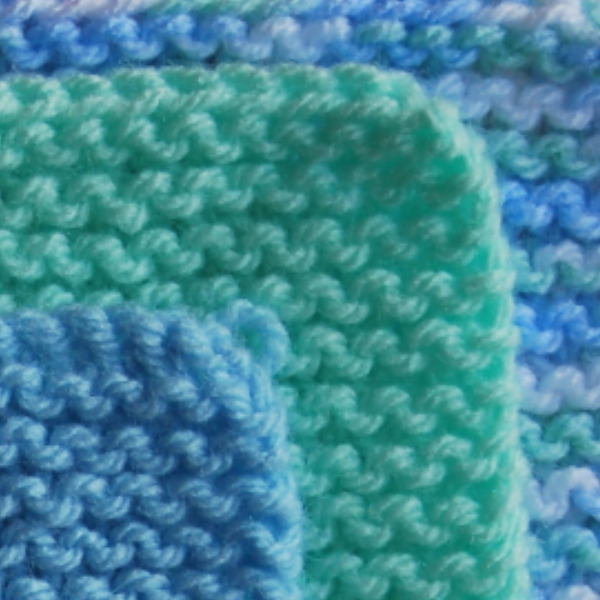 All three are a great place to source ideas and see what other knitters are doing. On Ravelry you can search for the type of pattern you want, and unlike some sites the search function is not too bad. You can search by type, yarn weight and free or paid so go and check it out the next time you are looking for a pattern. 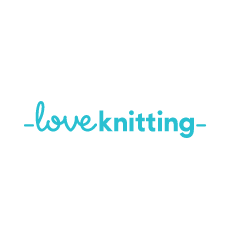 I have found a lot of great patterns on love knitting and have also purchased most of my Zing circular needles from them (before I started stocking them in my own store at least...). Quite a few of the patterns on this site are free, others you need to pay for, but the selection is huge. Not a great search function on the site though. Be prepared to wade through a lot of pages to find what you need. As with love knitting, I have purchased a lot of patterns (among other things) from Etsy. Better search function definitely but I think love knitting has the better range of patterns. Still worth checking out though. 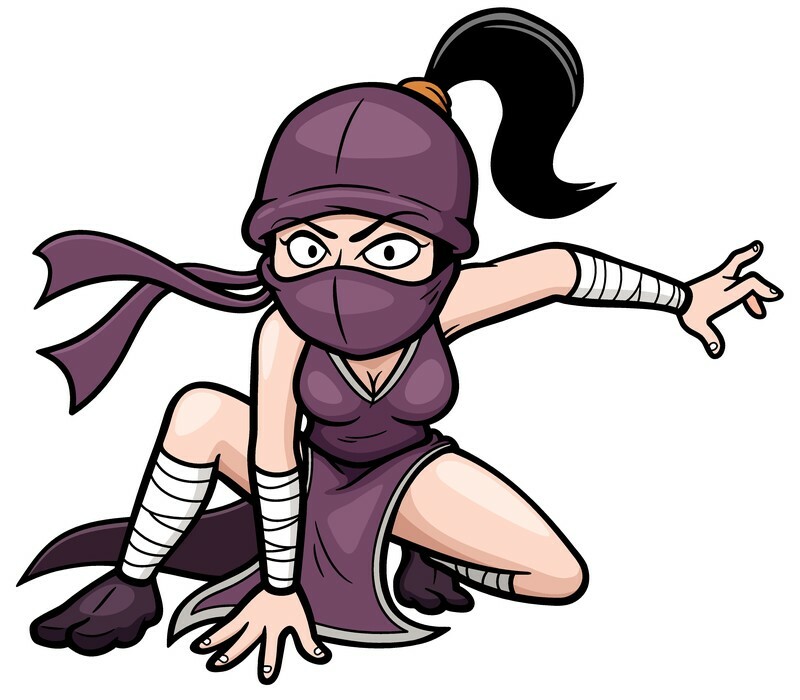 Borrowing or Copying Patterns = Stealing! A word of caution about respecting the copyrights of the pattern designers. There are some enterprising people out there who are scanning old patterns and offering them for sale on eBay and other auctions sites. Many of their customers like to think that they are doing nothing wrong and are just happy to be getting a bargain by paying $9.50 for 70 odd 'vintage' patterns. But just because the patterns are old or out of print does not mean that the company that created them no longer owns the copyright! You also need to be careful if you are planning to knit for profit. By that I mean that you are planning to knit items based on someone else's pattern that you intend to sell. Not all designers include the right to sell finished items in the purchase price for their patterns, so you may find yourself in hot water if you do not get permission from them. Don't become a thief by accident or design. 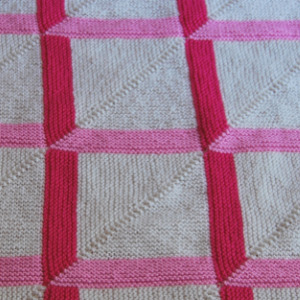 If you want to use a pattern buy your own copy directly from the designer or publisher. 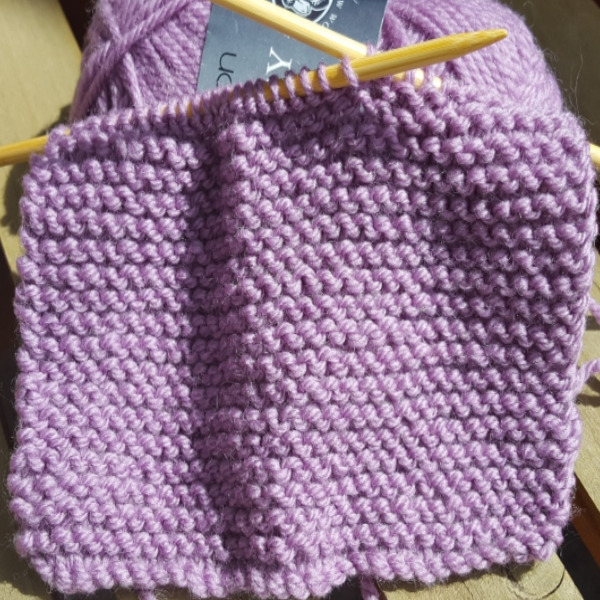 And remember that generally when you buy a knitting pattern or a pattern book, you are buying the right to use the information for personal use only. 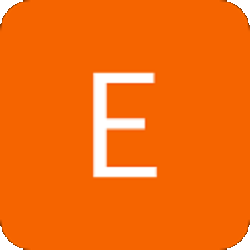 As a general rule, assume that you cannot resell for profit unless you have a prior arrangement with the copyright owner before you make up the garments for commercial sale. 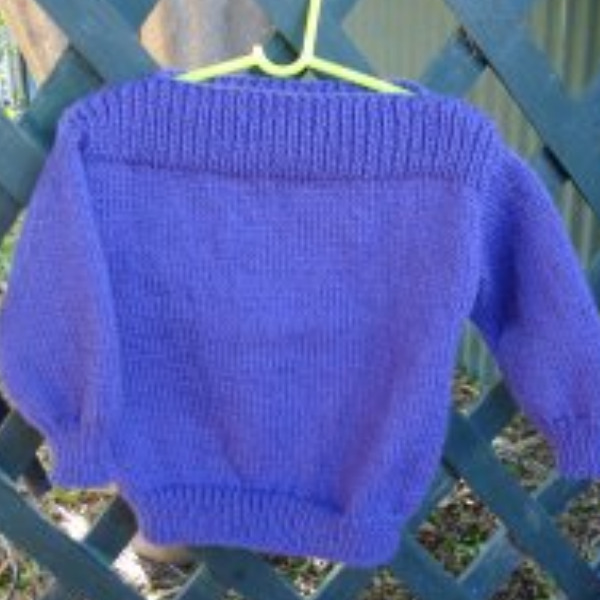 So, if you want to turn your knitting hobby into a business you might have to learn how to develop your own designs! Dont' worry though - it is not as hard as it seems. 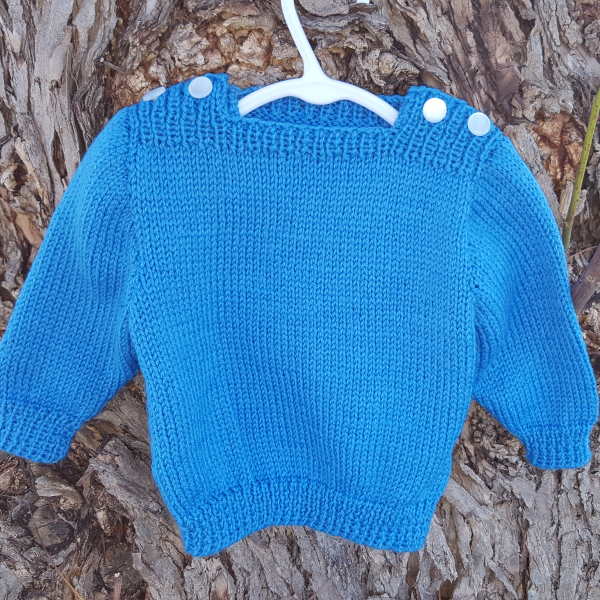 If one of my patterns is available free for download on either of these sites, you can assume that you have my permission to knit the item and I am also happy for you to sell the finished products (but only in limited quantities!). 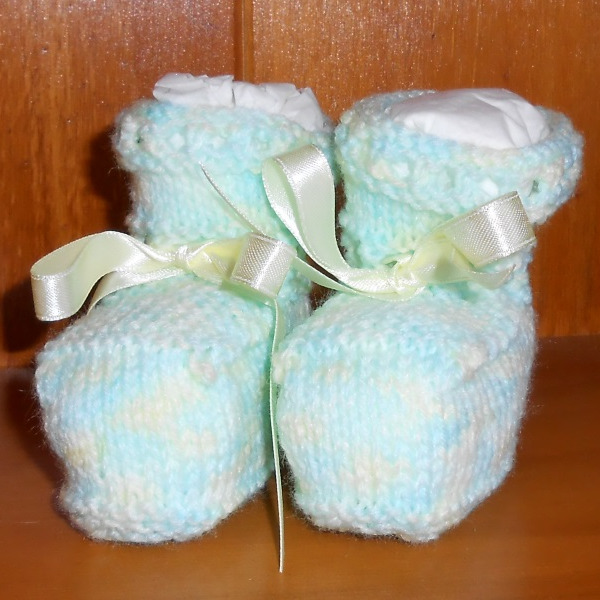 You can also share any of the free patterns providing you let people know where you got them. 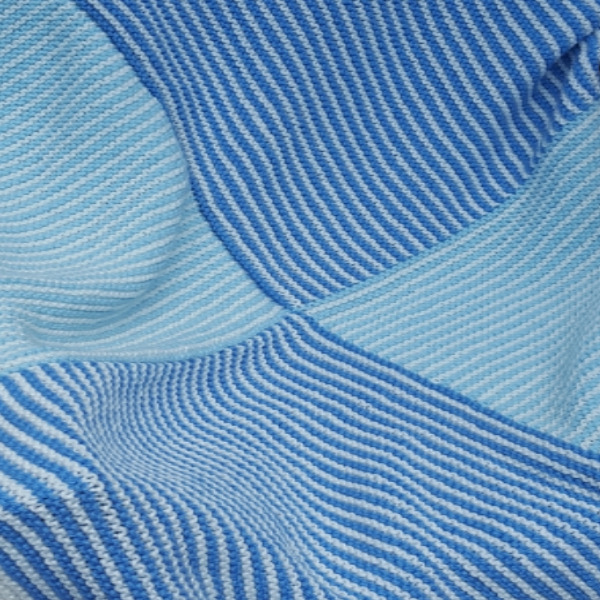 However, if you purchase a pattern from this site, you personally have permission to use the pattern in any way you see fit, but you do not have the right to share the file with anyone else. If someone you know likes one of these patterns, please direct them to the page on the site where they can purchase a copy of their own.